I have been using a NAS (Networked Attached Storage) device for more than 10 years now. Starting with a no-name Taiwanese enclosure that was really bad news, and moving on to the original ReadyNAS NV (power supply caught fire, replaced under warranty, then power supply fan died, could not get replacement to work), then the now Netgear-owned ReadyNAS NV+ (because I was desperate after the old one died, still running). The ReadyNAS NV+ has reasonable software for managing the unit, but the promise of being able to run other applications like Logitech Media Server to support music streaming has barely been kept. The performance is sluggish, and the release updates are slow. The box houses up to 4 drives, and my configuration is using 1TB drives, with a usable space of 2.7TB. 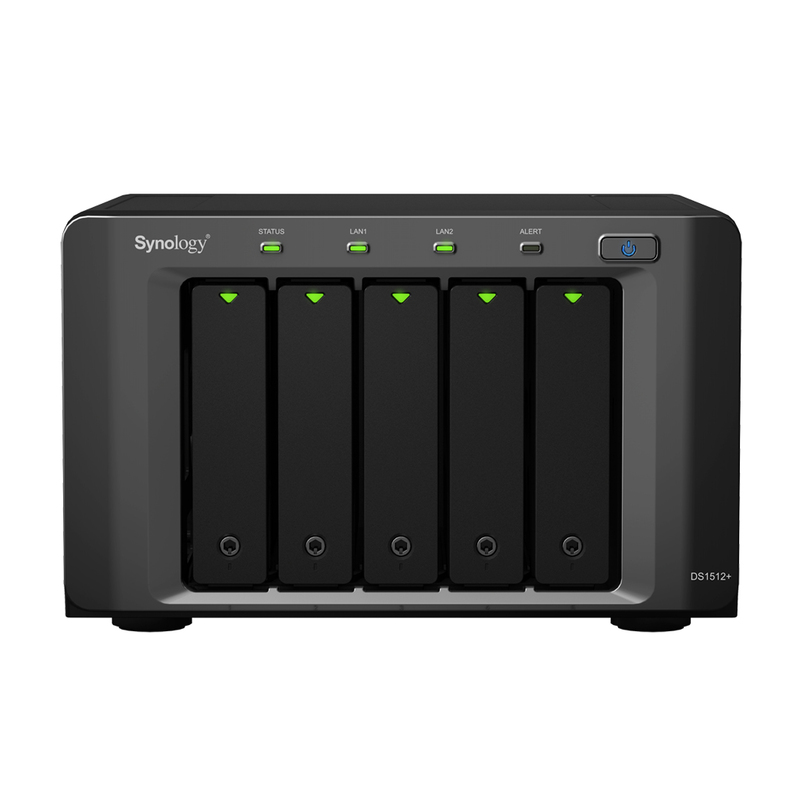 Reading a comparison of NAS units recently, I came across a brand I had not really looked at before – Synology. What really caught my eye though was their operating environment, DSM. Almost all devices sold are running some form of LINUX, so the differentiator is down to how well it is implemented, and how good the user interface (UI) is. 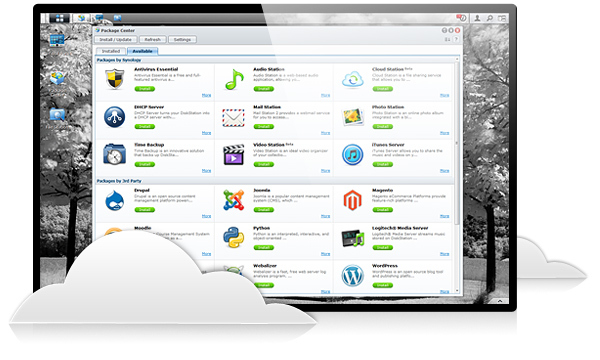 DSM is Synology’s flavour, and they have done a really spectacular job with it. The website had a list of applications that was quite extensive, but then went on to include quite a few 3rd party applications as well. The list of certifications was impressive, including VMWare, Citrix, and Hyper-V. Instead of being just a box containing hard disks, this was looking like a complete server environment. With the ReadyNAS NV+ approaching 5 years of life, I figured it was time to plan for what comes next. My data sets have continued to grow, with music, videos, photos, image backups, and file backups all creating demand for space. With that in mind, I looked for units that could handle at least four 2TB drives. The DS1512+ met that basic challenge, and had the additional benefit of dual fans, USB3.0 ports, expandable RAM, great read/write speeds, and most importantly for something that lives near me, was quiet. 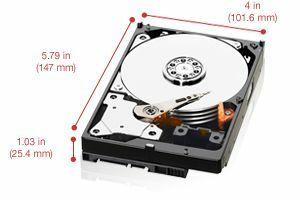 Western Digital had just announced a new line of 3.5 inch hard disks called RED, specifically designed for use in multi-disk NAS setups. The drives are quiet, run cool, and are designed for 24x7 operation. I went with five 2TB drives and easily installed them in the chassis. I powered up the NAS unit, and connected to it using the supplied setup wizard from a PC on the same LAN. There are a few settings to make, and then the formatting kicked off. I let this run over night, and in the morning, had a freshly installed 7.4TB volume ready to take data. I let the unit burn in over the next couple of weeks in order to ensure that both the disks and the chassis had no problems. I was amazed at the difference in noise level between the old ReadyNAS NV+ (noisy) and the DS1512+ (silent). As promised, DSM is a joy to use, with clear informative icons, well thought-out menus, and simple to understand settings. Using Package Manager, I started installing a number of Synology apps to create a photo gallery, VPN server, Media Server, remote audio streamer, and remote video streamer. Synology provides portable apps for IOS and Android to connect back to content on the NAS, and the installation and setup worked flawlessly. I have both an iPad and an Android Google Nexus 7 connecting without problems, allowing me to manage the unit from anywhere in the world. Security is catered for with the choice of both HTTP and HTTPS (SSL) connections, and extensive and granular user managment in DSM. Feeling confident with how easily everything went, I decided to plunge on and see what the DS1512+ was like as an application server. I enabled the built-in MySQL and installed PHPMyAdmin to manage the data base, then used Package Manager to install Joomla, a popular open source CMS. A few minutes later, and I had the sample Joomla web site up and running, accessible from any web browser. I was somewhat surprised to see how fast pages loaded, and how little CPU and memory were consumed by the whole web site setup. This is not a theoretical hack, this is a fully functioning server platform. You can probably tell I am pretty pleased with the DS1512+. I have had a constant sense of being pleasantly surprised at the quality of the hardware and especially the software. This is as good as or better than systems sold into the enterprise market, and at a fraction of the price.